Fungal disease of the Deuteromycota group of fungi. Initially soft, brown areas appear at the base of the leaves which may then wilt and collapse, which is followed by a dark brown rot developing at the bases of leaves and stems, with a grey mould appearing on the stems above ground level. Young shoots may blacken and young buds may turn black and wither. Any surviving flowers and leaves develop brown patches. Where tissue has been damaged by the infection, and particularly in damp conditions, a fuzzy grey mould can often be found. This fungal infection can severely stunt the plant’s growth that season and prevent buds from flowering. So long as it is effectively dealt with the problem shouldn’t have any lasting effects on the health of the plant. 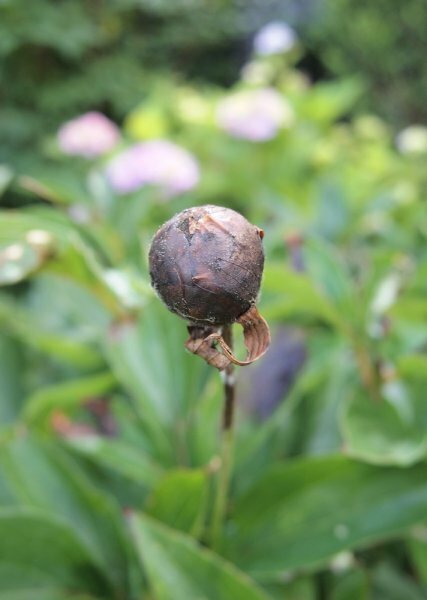 On peonies (including tree peonies) in spring and early summer, although an infection can continue to spread to other plants throughout the summer as the fungus releases more airborne spores. It particularly occurs in damp conditions and millions of spores can be carried by the wind to infect new plants. Ensure that the plant is in well drained soil and that there is good air flow around it. Don’t overwater the plant and try to water at ground level (so the leaves and flowers don’t get unduly wet). If any parts of the plant is damaged (eg if a stem is snaped) then remove the damaged part cleanly to prevent the fungus infecting the wound. Deadhead any spent flowers promptly so the decaying petals don’t provide an entry point for the disease. Remove any affected parts of the plant as soon as you spot them, destroying the cuttings (don’t put it on your compost heap). Ideally do this in dry and still conditions which are less favourable to the spread of the fungal spores. Put the cuttings straight into bags so you’re not carrying them loose across the garden (and shaking off spores as you go!). Cut any affected plants down to ground level in the autumn and destroy the plant material. Remove the top layer of soil (where the fungus may be overwintering), again don’t put it on your compost heap, and replace with fresh soil. Avoid putting organic mulches too close to the plant as they can create the damp conditions the fungus prefers. There are no effective chemical controls available to domestic gardeners. 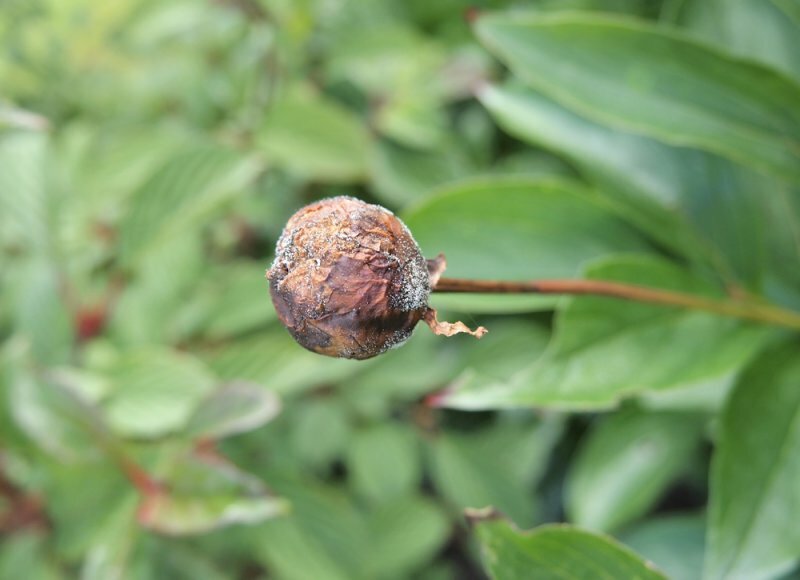 The fungus Botrytis cinerea is very closely related to Botrytis paeoniae and can cause similar symptoms on peonies. It is also a common problem on a wide range of plants.